After toiling on this project for an embarrassing number of years, I am very pleased to announce that my first book has now been published and it is available for purchase here and for download as an e-book on the Google Play bookstore. 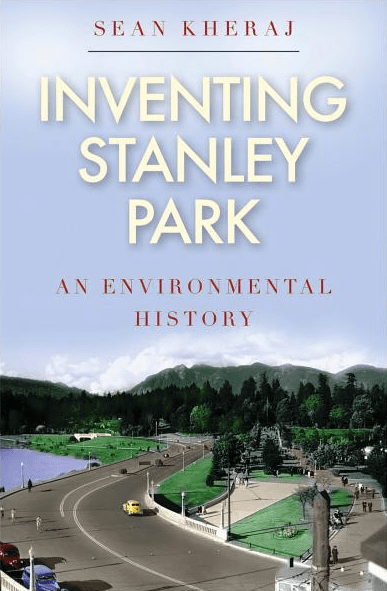 Inventing Stanley Park: An Environmental History is a landscape biography, environmental history, and social history of Vancouver’s landmark urban park. It is an exploration of the changing relationship between humans and a relatively small peninsula on the Northwest Coast of North America that became a world-renowned urban park in the late nineteenth century. The book covers the long history of Vancouver’s Stanley Park from its deep geological past to the present, from its original occupancy by Coast Salish First Nations to its resettlement by European and Asian colonists to its transformation into an urban park. Today Stanley Park is synonymous with Vancouver and Vancouverites jealously guard nature in this park from both human and nonhuman disturbance. In this book, I attempt to explain how this came to be and what role nature itself played in the development of this extraordinary urban park in Canada’s third largest metropolitan area. Appearing in the UBC Press Nature|History|Society series, the hardcover copy of Inventing Stanley Park is now available and the paperback edition will be available later this year. The e-book is also available now (and it’s on sale!). You can read the foreword and introduction here. I have also put together a companion website for the book where I will soon post some additional content, including an audio podcast, extra images, maps, and short articles on the history of Stanley Park that did not make it into the book. Check out http://inventingstanleypark.com for more.